More analytical than this rather mercantilist “strong currency equals strong country” syllogism or anxieties over more expensive holidays are fears of the impact of sterling depreciation on employment and living standards, made by one of the UK’s most distinguished economists Robert Skidelsky, as well as sometime sterling speculator George Soros. Every day in Britain money flows in and out of the City. 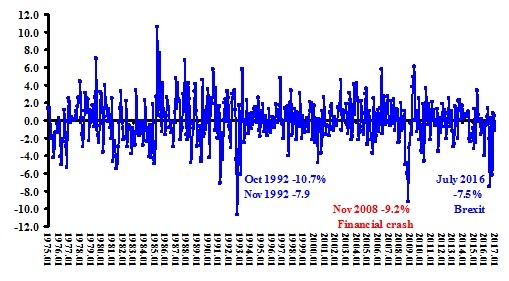 The daily net flow understates financial movements and the longer the time period the more misleading is the net measure. For example, in 2015 net money movement in and out of Britain was minus US$79 billion while gross movements measured quarterly summed to over US$1 trillion (inflows and outflows added together rather than subtracted). 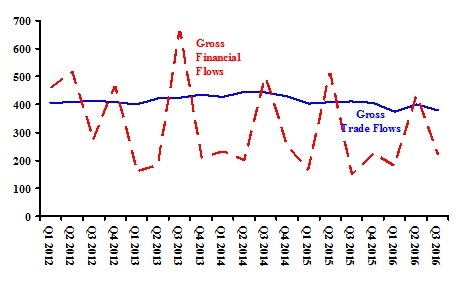 Net financial flow or any time period short or long is only a statistic; the flows themselves influence exchange rates. The enormous difference between net and gross only hints at the size and impact of capital flows, for it would increase arithmetically if we summed across months or days. The same is not true for trade flows, which involve an activity in form of a physical commodity or payment for a one-off service. Except for the category of “re-exports,” small for all major countries, there is no difference between net and gross exports or imports. Because currency flows consist of a stable component and a variable one, the latter will determine movements (an obvious inference validated by taking the first difference or differential). The temptation should be resisted to assign movements in the pound to volatile capital flows and the average level of the pound to relatively stable trade. The interactive relationship among the three—money flows, trade, and the sterling rate—is far more complex. In my opinion, the most likely causality is that financial flows determine short term exchange rates and short term exchange rates are one of many influences on trade flows. Notes: Gross trade is sum of exports and imports of goods and services. Gross financial flows are sum of inflows and outflows of primary income, secondary income, direct investment and portfolio investment. For any time period the latter increases with chronological disaggregation and the former does not. The policy induced recession of the early 1980s resulted in a five year decline in the dollar-sterling rate to near parity in February 1985. After a rise to almost US$1.90 in May 1990 four years of instability followed. This instability was punctuated by the pound dropping out of the exchange rate mechanism in September 1992. Most commentators attributed the recovery from the deep recession of the early 1990s in part to the sharp fall in sterling during 1992-93. Chart 3 inspects changes in the monthly dollar-sterling rate for the entire period of flexible exchange rates, 1975-2017, using the common measure with the later month in the numerator. It shows that on three occasions depreciation exceeded the Brexit fall: in two consecutive months in 1992 (-10.7 and -7.9, the Soros crash) and in late 2008 (-9.2%, in response to the Global Financial Crash). For many, the fourth worst monthly depreciation over 504 months may seem to qualify as a disastrous collapse. Closer inspection of the chart yields a more nuanced conclusion. The Brexit depreciation persisted for three months (end of May to the end of June, June to July, and July to August, -2.1, -7.5 and -0.3%, respectively). 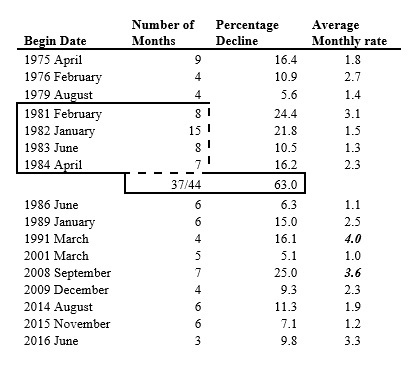 Over the same 504 months depreciation episodes longer than three months occurred 15 times, the longest beginning in January 1983 and lasting fifteen months. Under the self-proclaimed steady hands of George Osborne, two episodes of sterling depreciation continued for six months, the first (beginning August 2014) resulted in an 11.3% cumulative fall of the dollar-sterling rate. Two obvious messages come from the review of the 43 years. 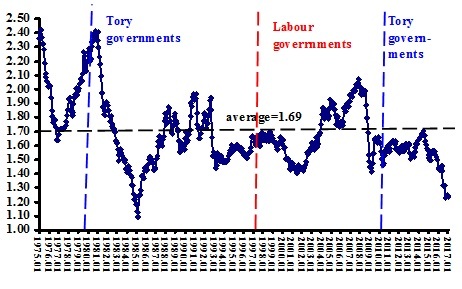 First, since 1980 the largest depreciation of the pound occurred under the Thatcher government. As the table reports, from February 1981 through October 1984 the dollar-sterling rate depreciated in 37 of 44 months with a cumulative fall of 63% (from 2.29 to 1.22). Second, the sterling-pound rate has a pronounced tendency to streaks of depreciation. Over the 504 months the rate depreciated in 256 (not significantly different from half). Forty percent of these depreciations occurred in streaks of four months or more, which suggests instability beyond the random. Note: Last column reports the simple average monthly depreciation, and averages greater than Brexit in bold. While the Brexit one month depreciation June to July was unusually large, it was not unprecedented. Further, the dollar-sterling rate has been at its present nominal level several times in the last thirty years. The episodes of depreciation in 2014 and 2015 support the conclusion of Nils Pratley that the pound had been at an unsustainable level for several years before the June referendum. As more and more governments applied policies of current and capital account liberalization, emphasis shifted to stock adjustment models. This analysis treated balance of payments flows as short term responses to economic “agents” adjusting their portfolios; i.e., their holdings of different financial assets. The dollar-sterling rate is especially unstable because almost all the short term money flows come in dollars. The unexpected outcome of the June referendum did not cause sterling instability. Financial speculation thrives on short term gambling in currencies in response to political and economic changes be they large or small.